Computex 2008 has come and gone, and with it a whole slew of product announcements and press releases with all manner of companies touting their contribution toward the “next big thing” in the world of computing. Although we at Logic Supply are more interested in the next small thing, there was still plenty for us to be excited about. High on our list was the expanded support for Intel’s new low-power Atom processor among third-party mainboard manufacturers. * This figure was given by Jetway’s own catalog on all of their Atom boards; however, a 1333MHz FSB is simply not possible with any current Atom processors, so I am unsure as to the actual specifications. Odds are good that with a Silverthorne Atom processor on board, the FSB speed will be 533MHz. ** I have seen two different images of this board; one with a passive northbridge cooler and one with an active cooler. I do not know which one will be the final version. While Intel’s Atom-based D945GCLF “Little Falls” mainboard has been out and about for a few weeks now (and specifications have been circulating on blogs for longer) it is good to see additional third-party support for the new Atom in a Mini-ITX form factor. Intel’s Little Falls reference design is a fairly full-featured and extremely low-cost platform, featuring all of the necessary I/O and peripheral support required in a modern computer. That said, variety is the spice of life, and the additional choice with regards to features, connectivity, and cost is always welcome when tailoring a system to your needs. The Intel Little Falls reference design is the prototype by which all following Atom-based Mini-ITX mainboards will be judged. When compared to the new offerings at Computex, the Little Falls is decidedly middle-of-the road, lacking some specialized features but not missing anything important: 10/100 LAN, COM and parallel ports, 2 SATA connectors, a PCI expansion slot, and a single DDR2 DIMM socket capable of supporting 2GB of memory; all relatively standard features for a Mini-ITX mainboard. In fact, the most notable feature of the Little Falls is the decidedly odd cooling solution Intel has placed on it. The Atom CPU sports a tiny finned aluminum heat sink that wouldn’t look out of place on a low-power northbridge, while the 945GC northbridge sports the unwieldy fan-and-cooler assembly that used to grace the CPU of the old “Little Valley” mainboard. This strange arrangement has resulted in slightly higher than normal CPU temperatures (although still well within acceptable limits) and a lot of headaches in terms of case compatibility, as the tall centrally located northbridge cooler interferes with all manner of 2.5” and optical drives, necessitating the development of a lower-profile replacement that we hope to stock soon. Despite these quibbles, however, the Little Falls remains a solid low-cost solution for all manner of embedded and consumer-based applications. In contrast to the middle-of-the-road Little Falls, the proposed specifications for J&W’s J945ITX01 are a bit more extravagant. This board seems to be directed more at the home theater/media PC market, sporting advanced S/PDIF audio connectors (both optical and coaxial), an extra DDR2 DIMM memory slot, and a DVI connector that can more easily interface with larger LCD and plasma-screen televisions. The DVI connector seems to have come at the price of parallel and COM port connectors, so it lacks somewhat in terms of industrial connectivity compared to other offerings. It also supports Gigabit LAN and an eSATA port, allowing data to be rapidly accessed or streamed from external storage solutions. The J945ITX01 also appears to use a completely fanless thermal solution with passive coolers on both CPU and northbridge. This might require a well-ventilated case for effective heat management, but as we have yet to actually see one of these in real life, we have no way of knowing whether or not core temperatures will be an issue. Gigabyte is another major board manufacturer who was very quick to jump on the Atom bandwagon. Their GA-GC230D is essentially a standard Little Falls with the trademark blue PCB and gold-colored heat sinks. They do use a lower-profile cooling system than the reference Little Falls board, but based on the specifications they have released so far, they would probably have to undercut Intel price-wise (no small feat with the Little Falls at $80) in order to counteract Intel’s brand name advantage. Jetway’s JNC91 is very similar to Intel’s stock Little Falls design, adding a pair of Gigabit LAN ports and some additional rear USB connectivity to the standard suite of I/O connectors on the back of the Little Falls. However, the unique JNC92 (also Atom-based) is much more interesting for many of our applications. While only supporting a single onboard Gigabit LAN port compared to the JNC91’s two, the JNC92 adds Jetway’s proprietary 120-pin adapter, allowing access to Jetway’s line of daughterboards. This allows the addition of up to three more LAN ports, four COM ports, a DVI connector, or even a combination PCMCIA and CompactFlash card reader. This versatility, efficiency, and low power consumption combined with Jetway’s lower prices may prove very popular in a slew of Mini-ITX applications. 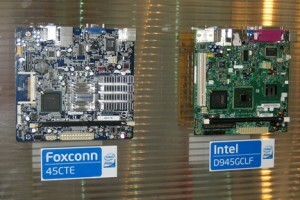 Foxconn showcased a pair of very stripped-down Atom-based boards at Computex. The 45CTP and 45CTE are both based on the Diamondville dual-core Atom design, which uses a faster 800MHz FSB and DDR2 677/533 memory than the single-core Atom designs, which are based on the Silverthorne core and run at a 533MHz FSB with DDR2 533/400 memory. The new Foxconn Atom-based mainboards also only support 1GB of memory when compared to the 2GB that the Little Falls supports. 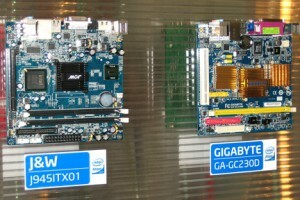 Both boards were somewhat lacking in connectivity, with no parallel or COM ports or IDE connectors. The 45CTE has only a single SATA port, but adds a built-in CompactFlash adapter and a single PCI Express x1 connector in place of the usual PCI slot. As a result, however, the board is slightly wider than usual and may have issues fitting in smaller case designs. With only the dual-core Diamondville processors to set them apart, these more limited designs seem targeted at more specialized applications where the limited I/O and specialized connections may prove to be more useful. With so many mainboard launches by so many established manufacturers, it seems obvious that Intel’s Atom CPU has had a successful launch into the Mini-ITX market. The variety of boards available at so early a time is promising to say the least. That board is very interesting… as shown, it deviates significantly from Intel’s reference specs. This is strange because Intel is positioning the Atom-based Mini-ITX systems as low-end solutions and appears to be discouraging other companies from adding more advanced features. I’m interested to see what comes of it. There are no official release dates, unfortunately. We’re currently in contact with J&W to find out more details. I was eagerly awaiting the arrival of Little Falls, until I read what to expect from the chipset, the 945GC. I just don’t get what Intel was thinking of, pairing a processor with a TDP or a mere 4W with what is essentially a 3 year-old chipset that gobbles some 20W. Did they have a warehouse of these things they needed to shift? I’ll still grab one for eval purposes (heck, they cost less than those brilliant little Emphase IDE flash drives), and I’m really interested in the lower profile cooler you’re trying to arrange, but Little Falls itself might not end up being that big a deal. Jetway’s JNC92, on the other hand, sounds *very* interesting, what with the return of their little I/O daughterboards. Any idea when those are slated to arrive? Craig, I think you hit the nail on the head. Intel’s cooling solution and chipset choice are probably driven by the fact that they have thousands of those ridiculous heat sinks and ancient chipsets to spare and want to get rid of them. That said, it’s very hard to argue with a solution that offers comparable performance to a VIA C7-based system for half the price… and the Intel brand name holds a lot of pull these days. Gigabyte has said that, thanks to its desktop chipset, the GA-GC230D is NOT really considered a low-power board, and they are hoping to release an Atom-based embedded board with a “real” low-power chipset sometime in Q4 2008. The Jetway JNC92 is definitely a cool board, especially when you factor in daughterboard support for I/O expandability. However, we have no solid ETA on when they will become available at the moment. 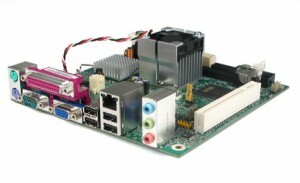 are you sure about the ref JNC92 as for me this spec is ref JNC90 (pict on mini-itx.com), JNC91 seem to be nice for a little server, what the final power consumption of this board ? Good catch. According to the Jetway product catalog I am working from right now, the picture on Mini-ITX.com is actually a JNC92 labeled improperly. In fact, there is no JNC90 anywhere in the catalog at all, and the picture for the JNC92 in the Jetway catalog is exactly the one shown on the mini-ITX site. Unfortunately I do not know which to believe, although I am biased in favor of the company’s official literature. Unfortunately, we do not have any of the Jetway Atom boards on hand for testing, so I do not know the actual power consumption of the JNC91. Our Applications Engineer hazards a loose guess at somewhere between 30-40W, as the 945GC chipset, being a desktop model, is somewhat of a power hog, even when paired with the 4W TDP Atom. The table at the beginning of the article is not quite right. The Little Falls board itself doesn’t support 6-channel HD Audio. The RealTek codec might. But the board only supports up to 4 channel sound. with the line in and out being remapped to the front and rear left and right audio. The mic in cannot be remapped, thus 4 channels. Hmm. Those specs were a direct copy from the official specification manuals from the various manufacturers. So I picked up one of the Atom boards, and as I expected, its performance doesn’t exactly blow me away. We have a simple little in-house benchmark that we run on everything that comes in here, and the Atom scores roughly half of what the Celeron 220 on Little Valley 2 is capable of. This in itself wouldn’t necessarily be a bad thing. Atom takes a different slant on things, sacrificing performance for lower power consumption. It’s definitely not all that bad given that it’s roughly 4.5 times faster than a Via PD6000 (600MHz C3) we bought a couple of years ago, and is almost exactly the same as the Celeron m 800 from iGoLogic’s now-defunct i3383. However, because of the damn chipset, there are no power savings to be had at all. Netbooted in a Morex Venus case without any kind of disk in the system whatsoever, it idles at about 33.5W (or so my WattsUp? Pro claims). That’s no better or worse than a Little Valley, which scores almost double that of the Atom on a single thread. Hyperthreading definitely results in the Atom saving some face. Firing off two instances of the benchmark results in a slight drop in per-thread performance, and the sum of the two threads is 88% that of the Celeron 220’s. Oh, and on a mostly-unrelated note, I’m really disappointed in Emphase’s new SATA flash disks. I love their PATA disks, but the SATA variant is a real disappointment. I’m sure they perform just nicely, but they’re completely ruined by the fact that they’re just too tall to fit in a iU case. That’s a shame, because I can think of a pile of uses for ’em, but I reckon I’ll just end up returning this one. What were you thinking, Emphase? Bad Emphase! Bad! Bad! You’re not the only one who’s complained about the rather questionable chipset choice on the Atom boards. Some sites have actually benchmarked VIA C7-based boards as lower power (around 22W) than the Little Falls (and associated variants) simply due to the more efficient chipset. However, I have heard that a few companies are in the process of developing industrial boards that are much more of a low-power solution. Also, about the SATA flash disks: that’s a great point, and I will try to talk to Emphase to see if they will be able to produce a vertical SATA DOM (Disk On Module) that fits in a rackmount case, as that does seem to be a bit of an oversight. Emphase does offer them in a right-angle format, pointing both to the left and to the right. If you are interested in them, we can special order them for you. We don’t carry many of them normally because they must be tested on each specific mainboard for compatibility… if the wrong direction is ordered, the right-angle units won’t fit! If this is an interesting solution for you, feel free to contact one of our technical sales associates. I read a surprising lot of negative comments on the chipset 945GC. How come that the many reviews of atom-based mini-laptops, which also contains the 945GC and works on battery, don’t complain about excessive power consumption and heat production ? The fact is that people are primarily complaining about how Intel is pairing a new, top-of-the-line efficient very low power processor with an ancient power-hungry chipset. Basically, the Atom processor draws half to a quarter of the power that a low-power VIA system draws (4 to 8W), but the VIA system comes out ahead in terms of efficiency because of the low-power chipset. Overall it is still a fairly low-power board, but many feel that this particular combination of chipset and processor is a wasted opportunity for what could be a low-cost, extremely high-efficiency embedded platform. In a mini-laptop, there is less space for ventilation, the cases are certainly not isolated in any way to reduce noise AND there is a lcd-screen to power (thus additional heat). Still many, if not most, reviewers claim they can’t hear the laptop, unless they put their ear on it. Yes, I know the CPU runs only on half wattage, but how could that 2W difference (but maybe the LCD with backlight needs that much) magically make disappear the cooling noises ? A pity I never ever read any objective sound measuring, I have the feeling that the words ‘quiet’ and ‘loud’ (though everyone HAS to use them in any review) have no meaning whatsoever. Does anyone have any comments about the Kontron KTUS15/mITX – 1,6? This seems a nice solution getting away from the 945GC chipset and I am very interested in it and am waiting for its launch. The Kontron KTUS15/mITX 1.6 is a very high-quality industrial-grade mainboard. It has long life support, very high levels of heat tolerance and shock testing, and is quite a low-profile board. It also uses a very low-powered chipset, bringing the total efficiency of the board up a significant degree. However, it is priced to match. I think one can expect to find retail prices in excess of four or five times the price of a standard Intel “Little Falls” mainboard. memory and a 2GB SD card that can be expanded up to 32GB. that appears on the bar and you are prompted to speak.